MyCNAjobs announces the recent addition of Professional Career Certification and Training Institute (PCCTI) to the myCNAjobs Scholarship Program. PCCTI has two campuses one in Chicago, IL and the other located in Oak Brook, IL. Both campuses are offering scholarships in support of the myCNAjobs mission to bring exceptional caregivers to the healthcare field. 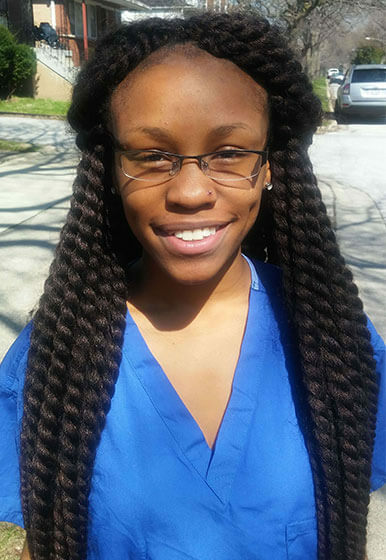 The PCCTI Chicago campus recently granted a scholarship to an exceptional candidate, Ambria D. Ambria is 19 years old but she has more experience and heart for the CNA profession than many caregivers twice her age. Ambria was inspired at a young age to become a caregiver. Her mother was a CNA and would come home telling stories of how rewarding the profession was. Ambria wanted to experience the same joy her mother did from helping those in need. At the young age of 8, Ambria began studying anatomy and her interest only grew as she progressed through grade school. She had her “entire healthcare career planned out since the 4th grade” Ambria states. Upon entering her Sophomore year in high school, Ambria became a medical assistant her passion grew and her Junior year she partook an internship as a Nursing Assistant at the local hospital. Her career path as a caregiver only prospered from there, her Senior year, Ambria completed Phlebotomy courses and achieved her certification, passing the boards with nearly a perfect score. Now, at age of 19, this born-to-be caregiver aspires to live out her dream even further by becoming a CNA. Upon asking Ambria what inspired her at such a young age to be so driven she stated "success in life comes when you simply refuse to give up. With goals so strong obstacles, failure, and loss only act as my motivation." PCCTI Chicago is overjoyed to welcome Ambria to their CNA program. The program director stated “Ambria is exactly the kind of caregiver we love to support. She is the embodiment of our mission”. PCCTI believes in providing educational opportunities to those seeking to enhance the quality of their lives and that of others. We recognize that a quality education is essential in assisting the student develop a sense of worth, high ethical standards and a sense of self-actualization as they pursue their professional and educational goals. Ambria will begin CNA classes via the myCNAjobs Scholarship Fund this May.